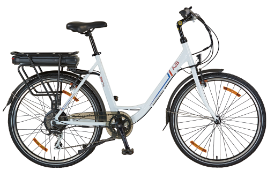 The ride quality is good, though not as smooth as the A2B Octave or Metro which offer full suspension and a padded seat, but all of these bikes are rear heavy with a battery design that is higher up. The fancy Y-frame and weight of the battery reduces stiffness and I could feel a bit of flexing during test rides. The motor powering this thing is quite strong, though very smooth and quiet because it’s a direct drive (gearless) design. Offering 500 watts of power, it accelerates well and can power up small hills without issue in throttle mode. It really shines however in pedal assist mode when you add to the system by pedaling along. The eight speed Shimano XT drivetrain works well and I’m a fan of the trigger shifters on the right grip that stay out of the way and let you firmly grasp the handles when riding.